The authors of the 5-star reviews have each told me that they did not remove them: SoulWhisperer (Tina Benson), Anodea Judith, and Lion Goodman. Screenshots below show they were all Verified Purchases. On Amazon, Soulwhisperer/Tina Benson had awarded a 5-Star rating. For some technical reason, when printing to PDF, the Stars didn't print. She also posted basically the same review to Goodreads, where the 5-Star rating was preserved with a screenshot. 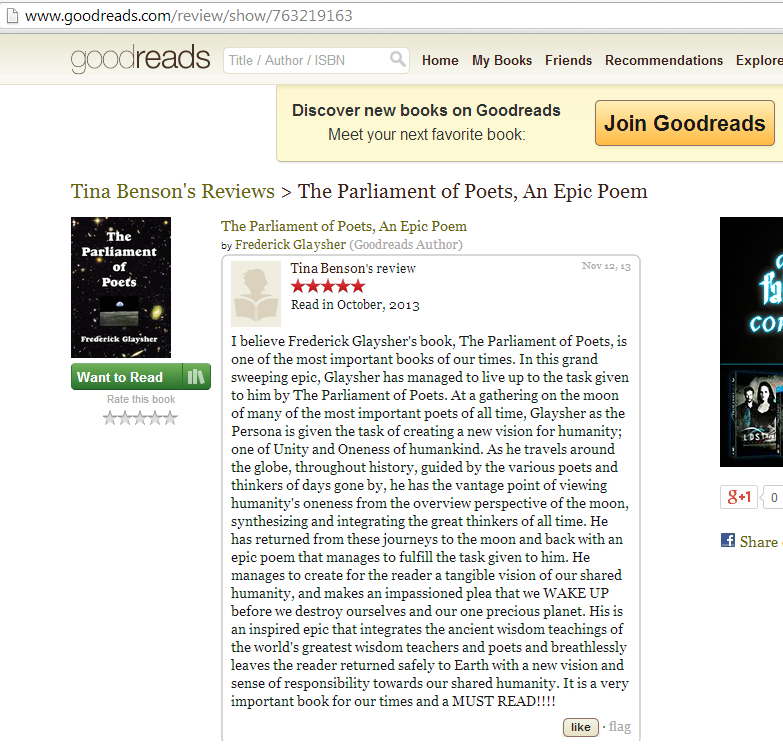 TEXT: "I believe Frederick Glaysher's book, The Parliament of Poets, is one of the most important books of our times. In this grand sweeping epic, Glaysher has managed to live up to the task given to him by The Parliament of Poets. At a gathering on the moon of many of the most important poets of all time, Glaysher as the Persona is given the task of creating a new vision for humanity; one of Unity and Oneness of humankind. As he travels around the globe, throughout history, guided by the various poets and thinkers of days gone by, he has the vantage point of viewing humanity's oneness from the overview perspective of the moon, synthesizing and integrating the great thinkers of all time. He has returned from these journeys to the moon and back with an epic poem that manages to fulfill the task given to him. He manages to create for the reader a tangible vision of our shared humanity, and makes an impassioned plea that we WAKE UP before we destroy ourselves and our one precious planet. His is an inspired epic that integrates the ancient wisdom teachings of the world's greatest wisdom teachers and poets and breathlessly leaves the reader returned safely to Earth with a new vision and sense of responsibility towards our shared humanity. It is a very important book for our times and a MUST READ!!!!" reposted 2-8-2017 after it was deleted the first time (second Jan. 24, 2018). On Amazon, see also extensive further details under the critical reviews by "callie b" and "Country Holes."